6 years ago in an LGS that isn’t around anymore, Robert Miller and I sat down. He traded me some of the cards I needed for my first EDH deck, Mayael, the Anima. Mayael was cheating and I wanted to cheat at Magic. 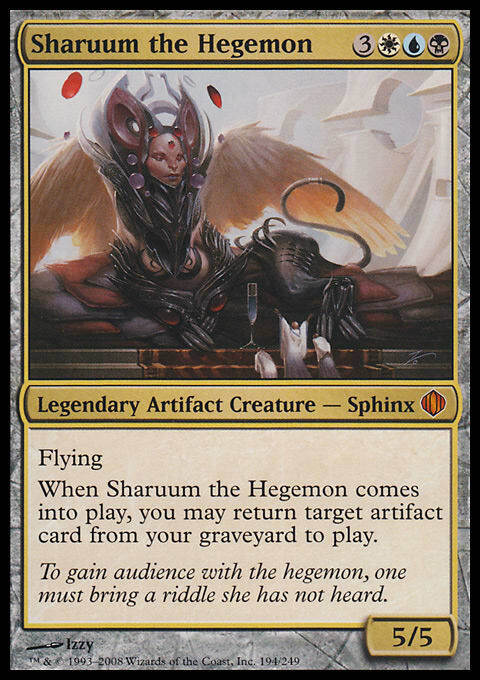 I picked up a few of the cards for Riku of Two Reflections and Sharuum the Hegemon. This was a few months after I had the epiphany that I would MUCH rather trade with EDH players than more competitive players because the range of cards they were interested in was far greater. I wanted to have decks so I could go to EDH night and hang out and not just look like I was there to trade with people - my motivation for joining the community was to simply belong to it and wasn’t particularly motivated by my desire to play EDH necessarily. I wanted to be part of the community, and so I was. Sharuum wasn’t the first deck I built but it was the first deck that vexed me. I didn’t want to be the Bitter Ordeal combo deck necessarily but when I started taking out combo elements, the deck began to lack an identity. I gave up on the deck before I cracked it, but my failure to get it where I wanted it was the impetus for starting down the path to creating the 75% theory. My Sharuum deck frustrated me - I never wanted to stomp the more casual players I was inclined to trade with at FNM night at the LGS or in the community college lunchrooms, but I wasn’t equipped to deal with being dogpiled by players competitive enough to handle Sharuum who realized how powerful the deck was and attacked me first. I ended up leaving Sharuum in my bag when I played and devoting more mental energy to the deck than to any other but still not cracking it. If I had to go back and try to figure Sharuum out now, all these years later, I would like to think I could probably do it. Instead I was treated to a different kind of loop closure when I ran into Robert again at a different LGS on Saturday and we got talking about the decks he was tearing apart. He had gotten a bit bored with Red Omnath and was taking out the Red and transitioning the deck to Titania. 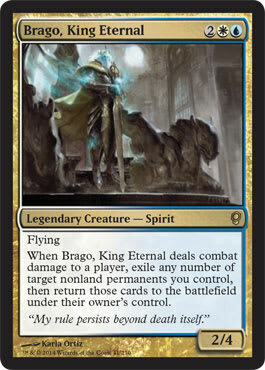 He also told me about his Brago Stax deck that he thought would be fun and ultimately wasn’t. “I’ve just been leaving the deck in my bag,” he said, which obviously struck a chord with me. It was the exact problem I spent the time since he helped me with my first deck trying to solve. I never fixed my deck but maybe I could fix his, and the idea I came up with was a sideboard. Cards that work together synergistically in a deck are sometimes referred to as a “package.” A Legacy deck with a “Stoneforge” package might have a few copies of Stoneforge Mystic, a Jitte, a Batterskull and maybe a sword or two. Cutting the “package” means cutting all of those cards and swapping in different cards. For a deck like Robert’s, I was interested in seeing if the “Stax package” could be something else - we could yank all of the Stax cards at once and replace them with different cards so when he sat down with a group he didn’t want to stomp, instead of holding up Stax cards because he wanted to take it easy on his opponents, he could play cards that were inherently less demoralizing. The deck could be a Stax deck for the pods where it was warranted, but with a few transitioning cards, the deck could be tuned up for a more casual pod without playing sub-optimally, holding up cards, or weakening the deck with compromises until it couldn’t function. We don’t like to start with a deck and weaken it to achieve a 75% build but if we could transition quickly and easily to a very different deck with some quick swaps, we could have a modular deck that is basically two decks but which functions in either scenario the way a 75% deck would not. I have said that a 75% deck isn’t necessary or even really optimal in most cases where you play with a known group and for this specific situation, I think it’s more appropriate to aim for a modal deck. There is no happy medium with a Stax package involved to shoot for - it’s akin to compromising with your spouse who doesn’t want to take your kids to Disneyland by taking them halfway to Disneyland. Some decks can get the 75% treatment, I’m not so sure about this one. If we want to hotswap out the Stax package at will, what do we cut and what do we add? Let’s take a look at Robert’s list. Based on a conversation with Robert and a cursory glance at the list, the Stax package is a little more substantial than it appears at first blush because there is quite a bit of tutoring. I may end up including some of the tutors in the cards to include in the “swap” list not because I particularly have a problem with these very toolboxy tutor cards but because if I cut a lot of artifacts and don’t replace them with artifacts, they may just get worse and want to be replaced with either tutors that get the new cards or with card draw to find what of them you can. Let’s take a look at what likely comes out and what we replace it with. The Stax package was pretty modest in this deck and it was made possible by the large amount of tutors in the deck. I think it’s possible to cut those down if we have more cards we want to add, but I think if we can only add 5 cards here, the artifact tutors don’t get that much worse even if we don’t add any artifacts back in because we only cut three. If I am putting 5 cards in, here is what I would add. I’ll also discuss more options as you begin to hew away cards like Muddle the Mixture and Mystical Tutor. This is a pretty modest package but I feel like it substantially shifts the way the deck plays against other decks. Instead of locking people out, you’re frosting down their permanents, slowing them substantially. Decks that chain permanents coming into play are hampered a lot, Splinter Twin-type combos no longer work and you slow the game without locking anyone out. I feel against weaker decks, slowing them should give you enough time to win but won’t frustrate them the way a Winter Orb would. We removed three artifacts and replaced them with three enchantments which makes your artifact tutors slightly worse but the real issue is your difficulty finding these enchantments. One method to dealing with this would be to consider freeing up two slots for Thorn of Amethyst and Sphere of Resistance. Those come down much earlier, slow everyone down equally and hamper the decks that were going to play a lot of spells in a turn more than they hamper everyone else, meaning the player that would have surged ahead is more in line with the group. Having Muddle the Mixture or Whir for those seems fine to me. Another artifact that can bring the best player in line with the group is Damping Engine. The farthest player ahead can’t surge ahead without making some sacrifices. Specific “fairness” cards like this are preferable to cards like Tangle Wire in a more casual setting since you’re only hurting the person who breaks parity first, even if it’s you. The new build isn’t likely to be all that competitive at a spikier table and with the heat you’ll get for playing Brago, you’ll need every tool in your arsenal to fend off the early beatings you take so I wouldn’t recommend trying a 75% build for this commander specifically if you’re built like Robert. Rather, we can make adjustments to the deck before the match with a kind of sideboarding strategy. This seems less like “Taking a stronger version of the deck and making it weaker” which is something we generally try to avoid but rather swapping out cards that do one thing for cards that do another thing. Frosting their stuff isn’t worse than Tangle Wiring it per se, but it works more effectively in different groups. What do we think? Have you tried the sideboard approach in your own deck-building? How did it work out? Did we make like a Dwarven deck-builder and cut too greedily and too deep? Would you have made different cuts? Leave it in the comments section below. Thanks for reading, everyone. Until next time!